Destiny, NY is set in a version of New York City where magic is a real and accepted part of life, Logan McBride struggles to find purpose. She was the subject of an incredible prophecy when she was a child, but fulfilled her foretold destiny when she was just thirteen. Now in her twenties, Logan navigates through graduate school for Prophecy Kids while searching for her place in a world that tells her sheʼs already finished. 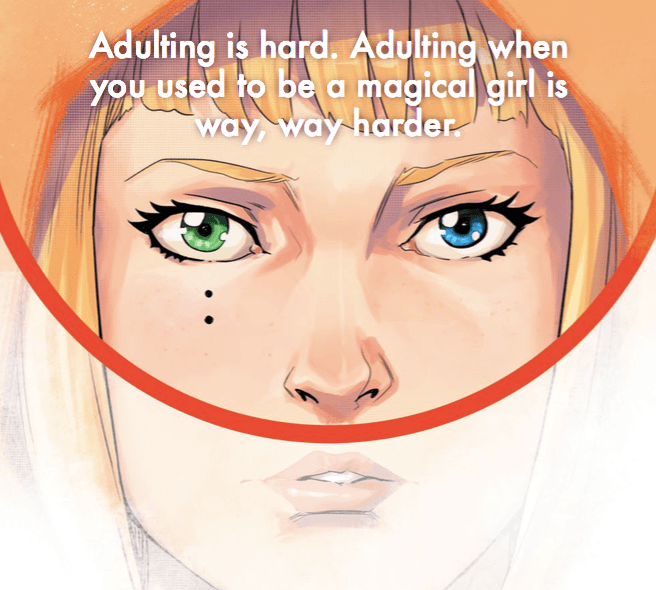 Slice-of-life romance and drama meets the mysterious intrigue of urban fantasy in the first volume of this brand new graphic novel series by author Pat Shand (Guardians of the Galaxy, Robyn Hood) and Manuel Preitano (Wonderland, Goddess Inc). I’ve always enjoyed Pat’s work, and Manuel’s art is amazing, so when I had the chance to back Destiny, NY on Kickstarter, I jumped at the chance. And here’s me glad I did! Imagine a New York where magic is real – a New York where people have a destiny. We have seers, who give details on those destinies, someone has to help them, guide them and also to prepare them – not only for their destiny, but also for the world after their destiny has been fulfilled. That’s where Destiny, NY comes in. As detailed right at the beginning, we are at a college where those who have a destiny can learn! It’s an excellent beginning and the framing of it gives us a look, not only at the college itself, but also of the students, and our main character Logan. Logan has a problem, she’s fulfilled her destiny early and she’s struggling to find her place – not only in the New York, but also as far as relationships go. Her character is built on as we work our way through this adventure, and as you would expect of someone this age – not withstanding the magic side of things – there are some ups and downs. The ups and downs are not just teen drama based, but they are also based around the magic side. Pat has found the perfect mix here. There is the mundane, as well as the fantastic. Logan isn’t the only character, not by a long shot. We get a whole cast of characters, which not only build up well into the main story, but also have their own drama’s and prophecies too. Some are students, there is the teachers and then there is Lilith. Lilith is a mystery, and her story builds up nicely as we progress through this first volume. And progress I did, once I picked it up, I couldn’t stop reading! Logan’s story works well as she finds her place, her destiny is only a part of who she is and this story tells that really well. We get romance, action, magic (of all sorts) and drama. What we have here is a brilliantly created universe, where there is so much scope for more. In September the Kickstarter for Volume 2 starts – check it out. Manuel Preitano’s art is excellent – with some real emotion going into the story and this shows up in the art. Characters work so well and you can get a lot from each panel – emotions, small glances, everything. Flashbacks are washed, as memories should be and the tones and shading make this a joy to behold. The panel transitions are excellent, working well together and building tension and showing the story in such a way that you can’t stop looking. Yes, I have read this in digital, but I really hope I can get this as a physical copy to hold in my hands, but however you can get this, I think you should.